I was recently following an online kerfuffle about the role that folks who blog about Paris play on the Paris dining scene. On one hand, there’s those of us that live and write about the city. On another are newspapers and magazines that do the same thing. I think I might be living under a rocher because although I do follow and read some of the various bloggers that also write about Paris, I don’t know if I perceived any problems with what they were doing: like journalists and television hosts, they’re simply writing and presenting information about restaurants in Paris. There was some talk that people who live in Paris were writing up restaurants and people couldn’t get in to them. It’s an honest assessment as some of the “hot” restaurants in Paris have less than a few dozen seats and many of them only do one seating a night. So those eighteen seats because pretty valuable. In a place like New York City or San Francisco, for example, a restaurant might have fifty or a hundred seats, and do multiple seatings. Even so, reservations at restaurants du moment are often hard to secure in the states. But in Paris, with so many fewer seats, places fill quickly and extra attention can overwhelm a restaurant with a small staff. Recently I was trying to get into a place I like a lot here, which I wrote up about a while back, and the waiter laughed when I stopped by and asked for a reservation. While I love the restaurant and the chef, it was unfortunate that getting a table at a place where I used to enjoy quite a bit was now next to impossible. Unlike Americans, French people don’t make long-term dining reservations. The feeling is “How do I know where I want to eat two months from now?” And I tend to agree. One of the things that I always liked about the Paris dining scene was that except for some of the three-star or “hot” restaurants, you could call and get a table that same day or just a couple of days before you wanted to dine. There wasn’t the mad crush to get in to the latest hot-spot. This month I’ve had a cavalcade of friends visiting and, of course, they all wanted to go to the same restaurants they’d read about in the newspapers and food magazines back home. I later learned that one was actually featured on a popular television program that had a certain amount of ‘foodie’ cred, which contributed to some of their excitement as well. I didn’t like having to disappoint my visitors, but every place I called on their lists was complet, complet, complet. So I’m not sure what the solution is. And I don’t know who to “blame”—Newspaper and magazine writers? Local food bloggers? Online forums and bulletin boards? People with television crews in tow? Information moves around the internet and in print and you can’t stop it, that’s the nature of news today, and it’s a little unfortunate that it’s caused a bit of consternation amongst people living and visiting Paris. But then again, if you think about all the dire problems in the world, maybe it’s best not to pay all that much attention and just go to the same places you’ve been going to for years, as I usually do. The good thing about getting older is that you know if you just wait patiently, eventually everything will settle into some sort of normalcy. And really, as long as a place has rosé, I’m happy. Some diners also now want to know where their ingredients are from. Steak frites? What did the cows eat and how ethically were they raised. Fish? Is it sustainable, or it is one of the species that’s on the verge of extinction. Vegetables? What country were they grown in and what are they sprayed with. I don’t know of any traditional bistros where those questions are asked or answered. But I do know that the image of dining in a lively bistro, drinking carafes of wine and spooning up French onion soup or ripping into a crisp piece of confit de canard is still appealing to a mix of visitors and locals. The first time I went to Le Petit Saint Benoît, where you’ll find a nice mix of both, I worried out loud to my friend who took me there not what farm grew the lettuce, but that because of the location just off the Saint-Germain and the affordable prices, if it would soon get discovered then be overrun by tourists. “Oh no, the bathroom is a hole in the floor.” Which pretty much made me realize this place would never be destined to make it onto many people’s must go to list. There’s a pretty great phrase in French, “C’est correct.” It doesn’t necessarily mean “good”, but more or less means—”How it should be”. For example, the coffee at your local diner might be not the greatest cup, but we call it “diner coffee” and for diner waitresses to serve it in bottomless quantities, c’est correct. At Le Petit Saint Benoît, even though there’s a chalkboard menu, most of the selections probably haven’t changed since the place opened in 1901. 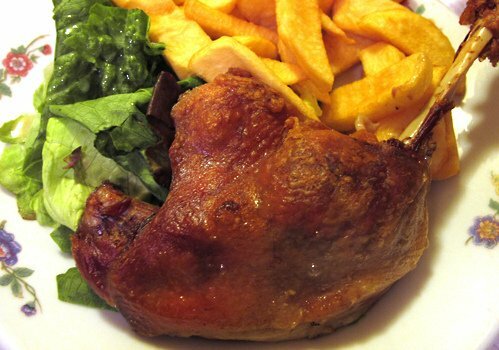 There’s a decent confit de canard, salade crudités (raw vegetables), the slightly-ropey steaks served at too-many bistros, and crème caramel. But it’s all pretty “correct”, and every bit of the walls festooned with Paris history, including a wooden revolving door to a metal spigot on the bar. The service is classically Parisian; efficient, no-nonsense, and the kind of place where my challenge is always to earn a wink if I quip with them. Oh, and by the way. The check is still scratched on the table, but the restroom has been modernized. In spite of any changes I don’t think Le Petit Saint Benoît is going to be the toughest reservation in town anytime soon. True, they do a booming business at lunch. But they don’t take reservations. So you needn’t worry. Interesting issue. You read about places but you can’t visit! To draw parallels – the demand for many food items such as cooa, quinoa, caviar etc has increased. To meet demand production (where practical) and prices have increased so those with the ability to pay can get access. I wonder whether this concept may creep into the restaurant scene. Exclusive restaurants do tend to increases prices but its not quite market determined like it is in the commodity markets – will high end restaurants become ‘commoditised’? Or is there chefs pride or other ethical issues involved? Time will tell. Three-Cookies: Interesting points. Curiously many of the hard-to-get into restaurants in Paris aren’t expensive and offer 3-course menus in the €30-€35pp range. They’re trying (I think) to appeal to a wider range of diners than the more exclusive restaurants that do indeed rely on fancier ingredients that cost more and require more work, and have larger staffs. There was a gastro-bistro movement started over a decade ago where some chefs decided to go ‘back to basics’ and that concept and those places are still thriving. The problem is that although most serve hearty, ‘normal’ fare, they’ve become a bit too popular and even the owners/chefs aren’t sure how to handle to overload. Thats quite a nice dilemma:) I want that in my business! 3. Do nothing: and not worry about the dilemma! While it’s true that it’s hard to imagine that a surge in business is a bad thing, I have a friend with a cookie company and all the cookies were handmade. He had to keep turning down new accounts because it meant not just hiring more staff and finding a bigger location, but he couldn’t find machinery to take on the tasks of the bakers (namely hand-forming cookies). All the machines were for huge, industrial-sized bakeries. Same with some friends with a company that made bean-to-bar chocolate. As they got bigger, they couldn’t find any way to wrap their chocolate bars so they kept the same group of capable women doing it who were there doing it from the beginning when they moved into a somewhat larger factory. 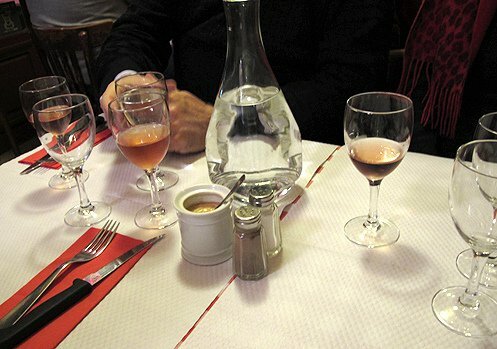 For the small restaurants, unlike in the states, in France often there are no hosts, busboys, runners, etc..in restaurants. People have less expectations in terms of swift, efficient service and aren’t as demanding in terms of having their water glasses refilled every time they take a sip or griping if the neighboring table got their entrées before they did. Also it’s very expensive in France to have employees, with the considerable social charges and taxes, plus stringent rules on hiring and firing. So small places need to find the right balance that makes running the restaurant financially feasible at the same time as pleasing diners. But you’re absolutely right about more places needing to open. A chef of a very, very popular place here and I had that discussion and it showed that the public is hungry for good, honest food at approachable prices. Oh, a good memory! Ate here several times when I coordinated Friends of Art from Kansas City. We always stayed at The Hotel Bel Ami, across the street. Haven’t been in five years. What about Le Petit Zinc? My mom had similar problems when writing a weekly food column called “Food Finds” for the local newspaper. The places that got highlighted in the column found themselves swamped with customers! But as has been suggested, I don’t think this is necessarily a problem for the restaurant owners. Let good food speak for itself, and let us speak for good food! We are the enemy and the enemy is us. This is happening everywhere as we flock to the most popular places, making them even more popular. And crowded. And unavailable. As I bemoan the thousand more expats that have moved to my little piece of heaven in Mexico, I have to remember that I am also one of those expat that crowded out the original residents and diners. At least one popular little bistrot in the 15th has gone to multiple seatings. It does mean that I can almost always get a Saturday night table after striking out everywhere else on my list. But I don’t really like it–7:30 is too early, 9:45 is too late. And it just feels wrong when they come to ask you to vacate your table. Do any of the Parisian food-destinations you frequent or recommend subscribe to online reservation services? These services are helpful when traveling in the States. I know that’s not the litmus test for what would be helpful elsewhere in the world, so I ask you. In Paris, I used a strategy quite opposite from online contact. Since I had lots of free time during an extended stay while my husband was on business, if I were told “complet” when calling, I’d get a reservation by going to the place and asking in person either on the day I desired to dine or the day or two prior. I used this strategy to get in to several places on your recommended list. Of course, I had lots of time to stroll around and chat with people. Susan: Yes, that’s happening more and more. The early seating is for visitors and is too early for me, too. And the later one is for the hearty Parisian-types who can stay awake much later. And I agree, it does feel very odd to have something handing you your check in Paris before you’ve asked for it (which to those who are reading who don’t know, is considered somewhat rude in France…it’s like saying “Scram!”) But I guess doubling up is the best way for the restaurant to allow more people to dine there. Mariann: I’ve not been but I’ve been told it’s very touristy. But can’t say for sure because I usually just peer in the window. Mary: I once met some representatives from an online reservation service that’s popular in America and I asked them how it was working in France. They said that it wasn’t, the reason they gave is that French restaurants don’t want to give up their reservation books. They want to control or know who is coming, I suppose. And as you found out, sometimes that can work to your advantage if you have the time to go in yourself and inquire. I tell people trying to call or reserve at “hot” restaurants to just go in that day and ask, as they get cancellations. And if you’re there in person, you might be able to get yourself on the waiting list. I LOVE your blog and recommend it to anyone and everyone who will listen. 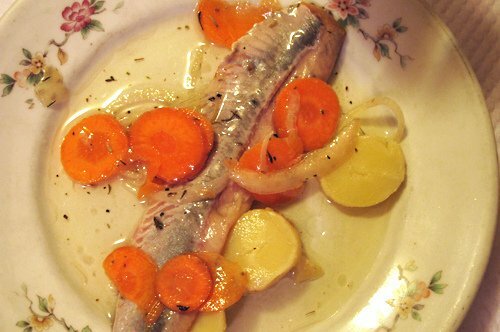 Can you tell us what the dish with the carrots, potatoes, onions, and what appears to be some sort of fish, is? Soup, salad? It looks delicious and cheerful! Never mind…sheepishly. Just click on the photo and the mystery is solved. Herring. I’m assuming pickled and cool or room temp. thanks David — all your information will help so much when I visit Paris later this year. 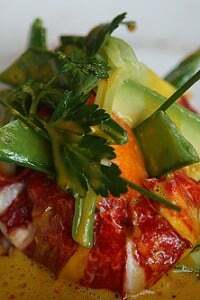 While you are in San Antonio this winter, I hope you have time to visit two of my favorite restaurants at the renovated Pearl Brewery complex — Andrew Weisman’s Il Sogno and newly opened La Gloria which serves mexican street food. If the weather is nice you should try to eat outside by the river. Il Sogno can be difficult to get into during peak times on the weekends, but during the week not so bad. If you are staying downtown, I also love to eat at Insignia. If I heard a fellow American ask these questions if I were in any restaurant abroad, I would be mortified and regard these diners as very, very rude. And I’d probably send glares their way. As much as I don’t mind hearing these asked in the Bay Area, I feel like this line of questioning is a “culture” that shouldn’t be imposed elsewhere. janele: I don’t know. Although it has gone a little too far in some extremes, it’s interesting to find out the story behind some of the foods in other cases. We were driving up from the south of France and stopped in a village, and the local restaurants looked very lame, so we ended up eating in a Vietnamese place that was pretty crowded. Margaret: Thanks for the tip. Normally they don’t schedule in much down time on these kinds of trips, but it’s certainly worth trying to sneak away for Mexican street food! When we were starving students, on those rare occasions when we went to restaurants, we developed the habit of going out for lunch rather than dinner. It has stayed with us for 40 years. We get a bit less food (a good thing), usually the same menu choices, and pay vastly less for the meal. 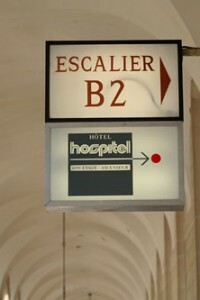 We also find, even in Paris, less crowded conditions and more attentive staff. We wake in the morning, figure out where we will spend our day, pull out the Pudlo’s (or consult our favorite blogger), and make a reservation. Happily, my husband’s accent is good enough that the restaurants rarely know we are Americans until we arrive — no way to “pass” with my Irish ancestry and his Dutch good looks and height, so we do not experience the rare “complet” when what they really mean is “we have enough Americans booked for today”. I LOVE Le Petit St. Benoit! I forget if you sent me there originally, but it’s on my list of favorites. I loved your post on the problem of promoting our favorite restaurants. I always waffle back and forth about what to include on the F& W Go List each year. While I love sharing what I know about Rome, I hate not being able to get into a restaurant. This has happened to our local trattoria and I have no one to blame but myself. So this year as I’m doing my round up I’ll take your advice, that any kerfluffle I create will die down eventually. I think this phenomenon has been going on for quite some time – it’s just more pervasive now because the sources and outlets for recommendations are so plentiful. I remember being in Paris in ’93 and eating at a bistro that was “du moment.” The thing was, it had been written up in the New York Times, so it was mostly populated by knee-jerk types like me who only went to places that the NYT tells me I wanted to go. Of course, that knee-jerking now applies to bloggers, too :-). Le Petit St. Benoit was the first Paris restaurant I ate in, in 1970, and I remember that “hole in the floor” as if it were yesterday: it terrified me! I went back to the table crying to my husband that I didn’t know what to do. He patiently explained the mechanics. I do remember the food fondly, and in subsequent years met alot of interesting people sitting out on a warm night. Paris might not be quite as bad as New York (I’m heading that way soon, and spending a disproportionate amount of my life right now trying to get a table at Momofuku), but I always tell people that, if you can get a table at a restaurant with no notice, there is a fair chance it’s not worth eating there. Or, put it another way, the places which are really, really worth spending on will require some effort in booking ahead. I know this doesn’t count as far as the kind of places one might like to eat on a wet Wednesday in February, but if you want to eat at anywhere significantly above average, then I am afraid I do think it applies. Even in Paris. You are never going to stop bloggers bigging up the latest ‘in’ addresses. The only answer is, as to out-nerd them and plan meticulously ahead. I like Cooking in Mexico’s response: “We are the enemy and the enemy is us.” There is no one to blame. This is the way it is. “C’est correct.” Of course it’s annoying and fun to argue both sides of the case, but in the end, dining out is a luxury, even at formule prices. Separate but related, I went back to A la Biche au Bois, expressly for the coq au vin, on the night before they were closing up for the holidays. They didn’t have it on the menu, and it nearly killed me. Hi Dave.,, Are you speaking of … Chez Robert et Louise… It got top billing on Tony Bourdain’s No Reservations on the Travel Channel……….. Looks like a great place but suspect it is now overrun with those pesky touristas !!! Well, looking on the bright side, my husband and I were in Paris over Thanksgiving and managed same-day reservations every day but one for the restaurant that was our first choice (selected after poring over Hungry in Paris and the recent Saveur article on bistros). The only place that turned us down (even though we said we could make it any of three days) was Chez Josephine — which probably was the “hottest” on our list. We ended up at Le Timbre, making a toast to Chez J. in gratitude for the fine meal and terrific service we were enjoying. Liked your comment about “c’est correct.” Here in the states, sometimes when you choose French at the ATMs, they’ll ask you if you’d chosen the “montant correct” – which seems kind of personal, right? I am surprised you did not tell the restaurant ” Mais c’est moi, David, je suis célèbre!”. it would have been funny to hear the reaction at the other end! Other than that, I find that I always preferred dining outside of Paris when we lived in France; much more enjoyable, Burgundy being one region that offers great food and restaurants. 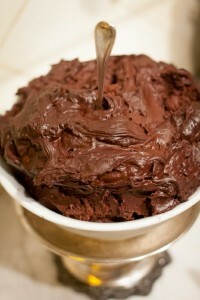 I used to work in a bakery in Texas that made all their cakes from cake mixes. A restaurant that sold all their cookies from frozen ones shipped from big factories. I guess the concern is always “the bottom line” and people are not demanding enough! It is quite enlightening !!! Makes you want to just stay home with some Surgele Picard : at least then you know what you are eating !!! It’s an age-old problem for restaurant reviewers (and now bloggers), telling people about the great places they’ve discovered, and then finding out they’re jammed. Actually, at least here in the US, most restaurant reviewers complain of the constant mediocrity, so if you’re finding lots of good places to go, you’re doing better than they are. It just means you go out more and find new places, which is what you decided. Nice solution to the problem. Or maybe you keep a few places to yourself, n’est ce pas? i was just thinking along the same lines as Dianne Jacob. a “best-kept-secret” hole can’t be too secret (or accessible!) anymore when it is publicized! 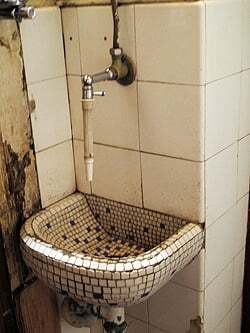 happens a lot here in manila… good for business, yes, but many a times, the quality suffers. there was one very good hole-in-the-wall thai place here that too many people wrote about, and was included in a recent “Manila’s Best Kept Secret Restaurants” coffee table book… now they’ve expanded into a full-fledge resto, lost the charm, and i dare say some of the flavor with it. i’m keeping mum about my favorite gelato place here. After watching the France 2 report that I linked to in my previous post (and, with the extent of my French, only getting the gist of it), it struck me why as a visitor I do latch on to restaurant recommendations such as your own. 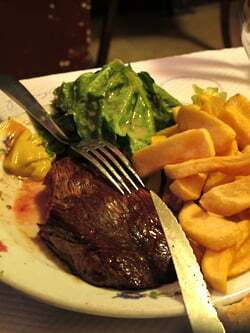 I’ve had some pretty mediocre food in Paris at restaurants that happened to be nearby and had a decent price. After watching this report on the widespread use of frozen industrial restaurant food (there is footage of the poorly paid Sri Lankan kitchen staff in a kitchen where the only appliance being used are the microwaves), I am even more committed to sticking with places recommended by reliable sources, even if I may have to work to get into them (or not). I warn you, however, that it will kind of break your heart to see the footage at Chartier…. it was first screened in that excellent Thursday night magazine Envoyé Special on Nov 25 with headline “La gastronomie du micro onde” almost 40 minutes in length and easily found on http://www.francetelevisions.fr and then to France 2 (channel) and on to Envoyé special and the title of program. You need a good command of French there is no subtitling not even in French. Do not miss reading the reactions to it. however as the procedure leading to aquiring the title is a bit complicated if free of charge there are no more than 1300 members so far. Program is made with irresistible panache and cruelty using hidden cameras serving you amply the hidden parts of the menu beginning with checking the packages in trash bins outside. Jean: When I was in Italy, the menus clearly stated if anything being served had been previously frozen, which I was told was the law. It’d be interesting if that was enacted in other countries, and if the diners would be surprised. Dianne: Since I don’t really do restaurant reviews, it’s not much of an issue for me. But I know for folks who live in Paris and write about the food scene here, there has been a few back-and-forthing about who should write about what. My feeling is that people who live here should feel free to write about places because if they don’t, print journalists who don’t live here will likely write about the places eventually. So why not give the ‘scoop’ to those ‘on the ground’? 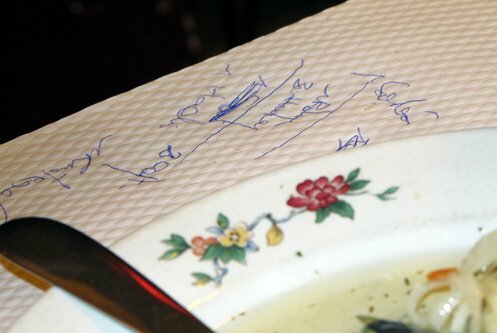 Thanks for pointing out this scary report on the food we eat in many French restaurants (the link to watch it again is the following http://envoye-special.france2.fr/index-fr.php?page=reportage-bonus&id_article=2591 ). David if you do as I described in my mail at 10.38 above you will get to the program. However I see that this mail is “awaiting moderation” so you may not have seen it. 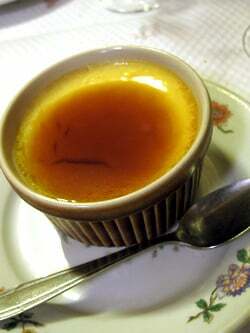 In France when menu states an item “fait maison” it is according to law made in the kitchen serving it. As for other dishes one never knows according to the French tv program. Your plate may be a grand rendez-vous for all kinds of readymade products heated in the kitchen. A fine bouillabaisse in Marseille may come at 58 euros according to the program so when you have the same dish for 15 euros, you bet it is served with a little help from readymade soup. It may not taste bad at all. to be sure this is how you get to this excellent French program on the hidden face of what is on your restaurant menu beginning by checking packages found in the trash bin outside. Remember to read the reactions to the program. Some are just heartbreaking. Restaurants brasseries and bistrots of averagely priced menus guarantee homemade food if marked “Maitre Restaurateur” but owing to procedures in order to achieve this status (free of charge) only 1300 members so far. Envoyé spécial in the list of programs. When on this fine site look for program of Nov 25 which is a nearly 40 minute long deliciously cruel documentary of much panache called “La cuisine du micro ondes”. Good command of French preferable but not all that necessary: pictures tell a great deal. The point is how fast industrially produced food (with high sugar content) are the ingredients in that French gastronomy which the Unesco recently elected a world cultural heritage. suedoise: I did finally watched the program (I found this link to be reliable, although I’m on a Mac and had to download a viewer) and it’s always been surprising to me that it’s become acceptable to serve this kind of food under the guise of ‘fresh’ or ‘maison’ (homemade) when in fact, it’s frozen or pre-packaged food. And yes, watching those nutritionists explain all the glucose syrup and other things they put in savory foods is really awful. I avoid restaurants that have a plat du jour unless I’m fairly certain the food is made in their own kitchen. Usually if the blackboard says something is served with rice or pasta, unless I’m certain otherwise, I assume the food is frozen or pre-packaged. I had dinner last night at a favorite bistro where a 3-course meal is €34, and the menu features game, homemade French fries, ice cream made on the premises, and similar things. The place as always, was packed, and it’s gratifying that indeed it is possible to succeed in Paris serving real food. One of the main complaints about fresh food is that it’s trop cher, or “too expensive”, and it doesn’t have to be that way. I don’t know why anyone would open a restaurant or food-related business unless they wanted to serve good food, but I guess to some people it’s just a way to make money, sadly. Mr. Lebovitz, my suggestion to you original querry is to tell your friends that all those places are now over. That you are in the business of finding the next-best and that they are welcome to go with you into uncharted territory. Love your blog. I today made Dorrie Greenspan’s French Apple Cake, and want to thank you for providing the recipe. I had a couple of thoughts about this recipe, however. Has anyone suggested dusting the top with sugar and caramelizing it with a blowtorch? Or is the blowtorch not considered a French kitchen instrument? Or maybe – at some point in the baking, topping it off with cubes of lightly buttered and sugared brioche, then sugaring and torching that topping? Anyway, it will be fun to try some variations the 2nd and 3rd times around. As for today’s cake, the perfect cure for a San Francisco too-cold Winter day. Seeing this posted makes me realize I did it in the wrong place – my apologies. I can nearly taste those meats just looking at these pictures. Thank you for sharing. It’s really beautiful food. if you can get a table at a restaurant with no notice, there is a fair chance it’s not worth eating there. He found places online, we picked places at random, and we also had a Paris friend’s recommendation. None of the restaurants were super trendy places, but they all had excellent food. We didn’t care about bragging rights. We just wanted to eat well. Because of the nature of blogging, there are always going to be exceptions to anything stated. Therefore I often have to add words like “fair chance” because while I state what I believe to be mostly the case, there will always be exceptions and variants. So generally speaking, many of the better places to eat require reservations because they are small and/or popular. (Especially those in heavily visited areas in Paris.) Small cafés you can just walk in but I know from experience when I have visitors, they come armed with lists asking me to make reservations. Am glad that you were able to find places that were good that didn’t require reservations. The point about inquiring about the origins of your food to be rude is curious to me. First, as consumers (here, quite literally) to know what it is that you are consuming and paying for seems to be a fairly reasonable expectation. The French savoir faire has set one of the highest standards for the providence of any product. I would think that if it is a product of quality that any interest would be welcome. Secondly, perhaps the feedback in hearing what is on the demand side of the equation could be an enlightening piece of information to those on the supply side. Greater transparency to a demanding public can only lead to a better dining experience, and if the trend towards ‘cleaner’ food continues, a healthier one as well. I love the “c’est correct” concept you write about. I think that having the right expectations about what you’re going to eat at a particular restaurant plays a huge part in what you end up thinking about the food. I love the flower-bordered plates (that seems “c’est correct”!) and completely agree with you about being happy as long as there’s a nice rose. I am looking forward to meeting — and learning from — you at Food Blogger Camp in Mexico! I made a two-month in advance reservation at Frenchie in person and am finally going on January 17th (I’d been meaning to do it before the No Reservations episode came out). For Spring, I like to go to the Buvette downstairs where I have not once had to wait for a table. Hey there, I’m visting Paris right now (delightfully crisp weather) and have not bothered to try and get into recommended restaurants. I feel too shy as a solo diner with no sense of direction. However, I have tracked down a few of your wonderful chocolate shops and would like to note that I was the only customer receiving charming service from the delightful Denise Acabo at A ‘Etoile D’or (just near the Blanche metro). Wonderful wonderful. 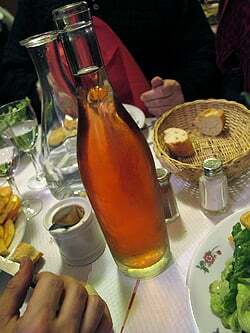 I was in Paris a couple years ago and we ate at about dozen restaurants noted on your blog. We got in every time without a reservation because we usually ate early – around 7pm, sometimes even 6pm. It worked perfectly for us with jetlag and all. So a reservation is not always necessary if you are willing to eat during off-peak hours.